Front Chainring Slightly Bent: Fixable? Discussion in 'Cross Country, All Mountain & Trail Riding' started by stumpjump, Jul 24, 2012. So I've got a 32t slx chainring on the front of my bike and today while riding I noticed that its slightly bent at two point around the rings. Its not hugely bad but its noticable and its been the cause of some rubbing against the front derailleur. I can bend it back close to perfect but Im wondering if theres even a point to it or if this is prob more a flaw in the material or something. Ive never had this happen before, but Ive always run steele front chainrings before. Should I take it to the LBS and see if shimano will replace or bend it back and keep on trucking? Disclaimer: Don't bend the shifting ramps. did you buy it bent? if not, then going back to your LBS would just be wasting your and their time. Word. How is something you most likely bent anyone else's fault? Bend it back or SUIP and buy another ring. Its one thing if you stripped the teeth or cranked hard during shifting, but the plastic piece that shimano uses for structural integrity broke and its pretty weak now. It'd be one thing if it bent over a long amount of time or something but ive had this ring for 2 months. I expect companies to stand behind their products within reason. im not familiar with the SLX cranks, but what plastic thing is/was on there? try bending it back like you would to true a disc rotor. get an adjustable wrench and tweak slightly until true again. just dont get all crazy and start cranking away though and bend it too far the other way. Bend it back. If it breaks or cannot be fixed, buy any of the variety of newer chainrings. I think truvativ has the cheapest, but as it's the most common size on the planet, it shouldn't cost much. It'd be one thing if it bent over a long amount of time or something but ive had this ring for 2 months. I expect companies to stand behind their products within reason. The most common way to bend a ring is to whang it on something. It is also possible (if you are the Hulk) to bend it by shifting and putting pressure on the pedals at the same time. I'm also confused. Do the double ring setups ship with a plastic bash guard? 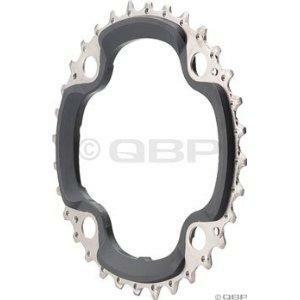 If you busted the bash guard then you have definitely been smashing your rings onto stuff. Jesus. It's $30. If it's really jacked up, buy another one. I think there's plastic molded into the ring for support. WTF? That looks lame. How is that plastic supposed to make the chain ring stronger? No idea. If it was me...I would replace it with a metal ring, like a Truvativ for $20 and be on my merry way.